With the end of the year approaching and Boxing's Best airing, HBO Boxing Insiders take a look back at the fights that aired on HBO and HBO PPV in 2017. Here, they make their selections for Fighter of the Year. It’s hard to give a fighter the year’s best honor when he fought just once in 2017, but in this case Andre Ward is the exception to the rule. With his convincing and devastating dismantling of former champ Sergey Kovalev. Ward proved he should be sitting atop the light heavyweight division as well as the list of pound-for-pound fighters. After Ward defeated Kovalev in their first meeting in 2016 by a razor thin unanimous decision, many felt the Russian power puncher was robbed. In the rematch this June, Ward answered any questions lingering from their first fight with a systematic beatdown of Kovalev, stopping him in the eighth round. Many outlets considered Roman Gonzalez the best P4P fighter in the world in March of this year. Then Srisaket Sor Rungvisai arrived for the first time on American shores with a smile on his face that hid his intention destroy an idol. Sor Rungvisai's record was nothing that would have alarmed Gonzalez. Since the previous June, he had fought three six-rounders and the fighters he defeated were making their professional debuts. Gonzalez had abdicated the flyweight throne in October 2016 and struggled in a win against Carlos Cuadras at junior bantamweight. Cuadras owns a technical win over the invader, but that was in 2014 and was more false assurance. As it was, Sor Rungvisai -- physically strong, heavy handed, unorthodox, and relentless -- proved to be a technician's nightmare. Gonzalez could neither hurt nor control him and a series of unintentional headbutts were at once painful and disruptive. A banged-up Gonzalez lost a controversial majority decision. The rematch removed all doubt. Sor Rungvisai trained four months to make sure of it. He knocked Gonzalez down and then out with a right hand and proved himself Aaron Pryor to Gonzalez's Alexis Arguello. An underdog both times, Sor Rungvisai conquered the best P4P fighter in the world. Srisaket Sor Rungvisai. Golovkin had a great year too. But Rungvisai single-handedly deposed the mini-Golovkin, Chocolatito, ushering in a new era atop the division and demonstrating that perhaps all the talk of Chocolatito as the "best pound for pound fighter" was a bit overblown. Andre Ward may have fought only once this year, but it’s all he needed to get my pick for HBO Fighter of the Year. Here’s a guy who essentially took a year off at what was perceived to be the height of his career, came back into the mix with a few soft touches, and then took on the “Krusher” in their highly anticipated 2016 fight. Say what you will be about the first fight, but Ward came out on top in the eyes of the judges, and when it comes to earning the W those are the only eyes that matter. Ward could have bounced then, he could have called it a career and left everyone wondering what could have been if only he and Kovalev had faced each other once again. But he didn’t want to leave any doubt. He wanted to make a statement. So Ward took the rematch, won in convincing fashion, and showed boxing fans he had nothing more to prove. He slayed the biggest name in the division not once, but twice, and went out on top, on his terms. There’s no fighter more deserving of this than Srisaket Sor Rungvisai. Not especially heralded before his first fight with the brilliant Chocolatito Gonzalez, even if he had been tabbed by a few aficionados as worth a punt against the small, aging Chocolatito, the Thai super flyweight produced a stunning performance to upset the Nicaraguan in a marvelous bout this March in New York. Then, six months later, he returned to double the dose, this time stopping Chocolatito in four devastating rounds. Keeping up the schedule, Sor Rungvisai returns in February against the terrific Mexican, Juan Estrada. Before that, though, he can take great satisfaction from an extraordinary year. This is a little hard, as nobody really separated himself from the pack. Had he faced Orlando Salido as scheduled and emerged victorious, the winner might have been Miguel Berchelt, who would have been the only boxer to go 3-0 on the network this year. Even at 2-0, you could easily pick him. There’s a strong case to be made for Srisaket Sor Rungvisai, who scored a controversial points win and a devastating knockout over Chocolatito Gonzalez, who was widely regarded as the number one fighter in the world pound-for-pound when the year began; if I believed he actually did win that first fight, I’d surely pick him. Had Gennady Golovkin been given the decision many feel he merited against Canelo Alvarez, he might have gotten the nod; had Alvarez begun his storming late-rounds comeback a round or two earlier, he might have done. But I’m going with someone who only fought once this year and, it seems, will never fight again. He bullied the bully and crushed the Krusher; after again falling behind early against Sergey Kovalev, as he had done when they first met last November, he got into gear sooner and took over the contest more comprehensively, before removing any doubt with an eighth-round stoppage. The draw between Canelo Alvarez and Gennady Golovkin last September made this choice a difficult one. Had a winner emerged from that collision—officially, that is, since GGG seemed to edge out a decision—he would have easily been the Fighter of the Year. As it stands, however, neither Golovkin nor Alvarez notched clear-cut victories over elite competition in 2017. In a way, neither did Andre Ward, whose stoppage of Sergey Kovalev was marred by poor officiating. That leaves Srisaket Sor Rungvisai, who followed up his debatable but arduous points win over Roman Gonzalez in March with a chilling KO that left no room for guesswork. He also took the guesswork out of this category. If either of them had fought more than once on HBO this year, I probably would have given this honor to Anthony Joshua or Andre Ward. But they didn’t, so I’m not. I’m instead recognizing Rungvisai, who went from an unknown outside of Thailand entering the year to a man who twice defeated the fighter who entered 2017 as the pound-for-pound king. Sure, the first win over Chocolatito Gonzalez was a highly controversial (read: incorrect) decision. But Rungvisai had knocked Chocolatito down and pushed him harder than anyone else had in his pro career, so it was at least a moral victory. And it was followed by an emphatic victory: a fourth-round knockout in which the once-great Chocolatito was made to look like a tomato can. That was Rungvisai’s coming-out party, and it made his earlier upset win feel more legitimate in retrospect. The anti-Canelo crowd had two main arguments against the Freckled Boy Wonder’s claim to superiority: he would have to face, once and for all and with no excuses, what they perceived as his two biggest threats. In 2017, he did. What are the excuses now? Granted: in the first one, Julio Cesar Chavez simply didn’t come to fight. And in the second one, he focused more on making Gennady Golovkin miss than on making him pay for it. 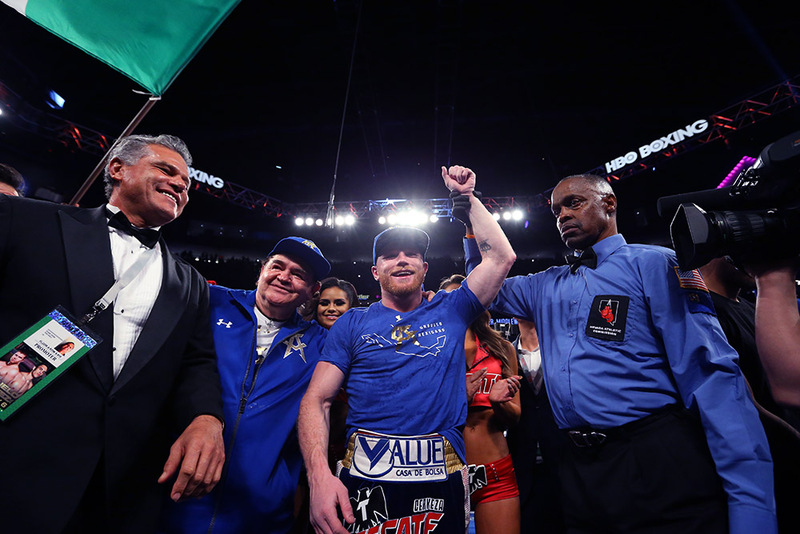 But even so, Canelo was only a few lucky twists and turns away from scoring two impressive signature wins in one year against his most dangerous foes available, and that has to mean something somewhere. In a world where fighters are rushed to the top of the pound-for-pound rankings after Globetrotting the Washington Generals du jour based on how good they look in the ring, someone did the hard work of facing the best out there, and has not yet been rewarded for it. This modest paragraph intends to serve, as best it can, that modest purpose. Srisaket Sor Rungvisai made himself a compelling case, but ultimately it's too difficult to disentwine his emergence from Chocolatito's downfall. Is the Thai fighter truly the best in the division? Or did the former pound-for-pounder from Nicaragua simply reach his expiration date? Andre Ward's lone opponent in 2017 -- a Sergey Kovalev who is very much still Krushing -- showed no doubt that the "Son of God" is still capable of beating the best, but I'd rather focus on the future than the past, and no one cemented their star status this year like Anthony Joshua, who did so on the biggest possible stage in the best fight of the year.